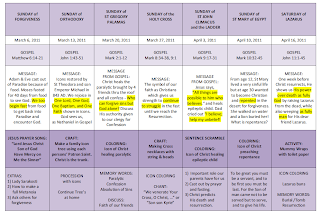 Here is a lesson plan chart for Orthodox Great Lent. 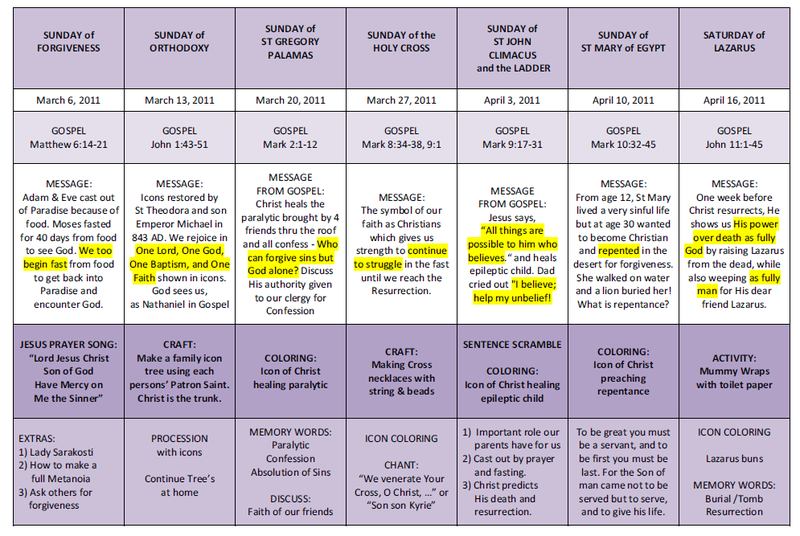 The lessons are designed for each Sunday leading up to Holy Week. Each session will include either a craft, coloring page, memory words, activity or hymn to chant. Every child will create necklace name tags on the first day, and decorate folders with fasteners inside that will become their workbooks. They only take home their craft each Sunday, as I will hold on to their folders until the end and add pages for Holy Week with Pascha. 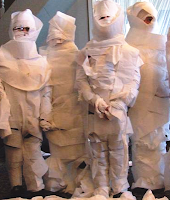 So far, I'm really looking forward to creating the "Family Icon Tree's" and Mummy Wraps with toilet paper for the raising of Saint Lazarus! If you have other ideas I can include, please pass them along! I'll be converting this whole chart to Greek as well if anyone needs that. UPDATE: I've recently added a sentence scramble activity for the older ones in the group. 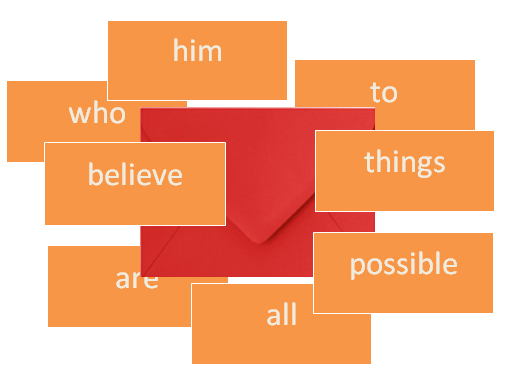 Basically, seal envelopes with words from at least two memory phrases and ask the kids to work in groups to put the phrase together. This will work well on the Sunday of St John Climacus. Thank you for the great ideas- I love how prepared you are!! Do you have what you need for the family icon trees? I may be able to save you some work, if I can find my old files. We did something similar during a day camp a couple of summers ago. The kids were learning about Sts. Joachim and Anna as the ancestors of Christ. We had printed out trees similar to those in the icon, and then had little icon medallions to glue into the branches, and blank medallions for them to draw pictures of themselves and their families. Our trees did not have Christ as an integral part. We had the children glue an icon medallion of Him at the top of the trunk. This is great. Thank you for posting such interesting and useful ideas. I found your blog a few days ago and i've been exploring it. I'm very much looking forward to the Lent Curriculum. Along with two more sisters, we're teaching little girls 9-11 years old at our parishe's Sunday School and we're always looking for new ideas and resources. Thanks for all this help! Looking forward to the rest...thanks for all you work! Hi Maria - If you have files we might be able to use, that'd be great! Could you email them to eleniemarie@gmail.com? Thanks so much. Would someone be willing to post 'how-to' make the family icon tree? We'd like to join in and make one also. 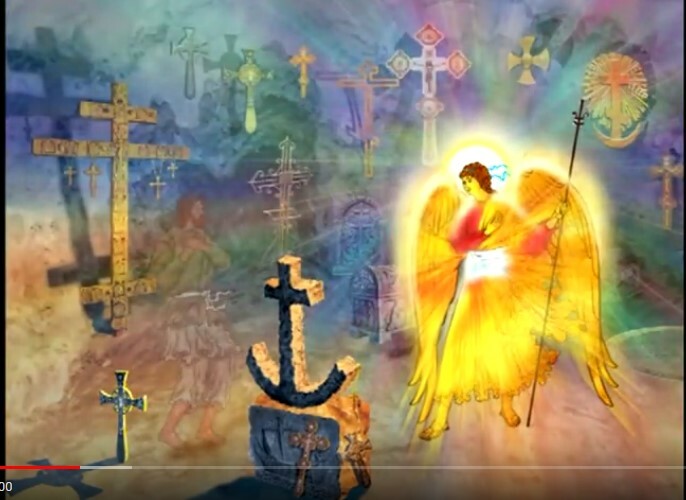 Hi, I'm new to Orthodoxy. I started attending during lent last year, but didn't really know what was happening. This year I want to be aware and prepared. This has been helpful to me, even though it's meant for children (I feel like a child in this arena). Do you have any helpful resources that can help me get the most out of Great Lent? Even if its material meant for children, that might be easy to understand. What wonderful news that you have found your spiritual home in the One True Church! For all of us, it is a new beginning with each new day...so we learn together! When I have a quiet moment to myself, or while driving to Church with the kids, this is really special to read out loud for the prescribed Sunday. We have the hard bound copy with many extra articles and descriptions: It hasn't been watered down....that I appreciate. Purchasing this is an investment for each year ahead. Having also a Holy Week book is a valuable tool. Listen, and experience the extra services...they themselves are our best teacher!